It has been a tremendous year of SeMiBluegrass music here in South East Michigan; a year simply overflowing with lovely and talented people, beautiful places and live, local music. 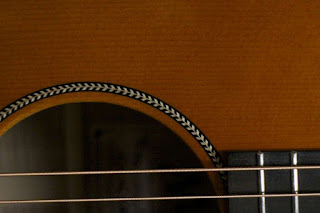 Be it at a bluegrass festival, house concert, music venue or bar show, when musicians gather to share their craft something magical happens; something that can transport you from the mundane to the extraordinary; something with the power to transform both musician and audience alike; something that can speak to the brain, encourage the heart and inspire the soul. One need only peruse the more than 100 bands profiled in these pages during the year to see evidence of this transformational phenomenon in action. So it is with great homage and respect to those performers when I state that the Ebird & Friends Holiday Show was---as it always is--not only the culminating event of my SeMiBluegrass year, but also the most incredible, impactful and important show I saw during the year. Musical legend has it that almost ten years ago Erin Zindle (EBird) of seminal South East Michigan Folk Rock/World Music Fusion band the Ragbirds was sitting at Ashley's Gastropub in Ann Arbor sharing with her friends how much she missed gathering at the holiday to sing Christmas songs with her family and the cathartic sense of joy and peace that it brought her. From this fond reminiscence grew the kernel of a idea that would ultimately grow into the must-see music event of the holiday season. While Erin is fortunate enough to share the stage with her husband Randall Moore and brother T.J. Zindle in the Ragbirds, she realized that her musical "family" had grown to include many of the local musicians and artists in South East Michigan. In 2008, Erin gathered this "family" to share their music and sing Christmas songs at the Hartland Music Hall--and a tradition was born. Nine years later, this annual event has grown to three sold-out nights at The Ark in Ann Arbor, and a magnificent, family-friendly Sunday Matinee performance at the Hartland High School Auditorium. I have been going to these shows with my family for the past five years and have always found them excellent. This year, I was able to attend both the opening night performance at The Ark, and the Sunday show and found this year's show to be among the best. Unlike a festival or traditional variety show, where multiple acts gather and each get to perform their own material, the EBird Holiday show focuses on bringing together the best and brightest of the local music scene and putting them on stage in front of an incredible house band for a holiday mashup performance. With a broad and diverse range of performances drawn from nearly every imaginable musical genre, there is literally something something for everyone in this show--which also presents quite a unique challenge for the house band! The band is built around the funky, world-groove Ragbirds rhythm section of Moore, TJ Zindle and John Brown, as well as percussion professor "Doctor" Dan Piccolo and Macpodz bassist Brennan Andes. Add in a funky, jazz-fueled horn section (Ross huff of the Macpoz, Bethanni Greczynski of Rhytha Musik, and Tim Haldeman on Tenor Sax) and multi-talented stings section of Brad Phillips (the Jeff Daniels Band), Brandon Smith (the Appleseed Collective) and Christina Furtado on Cello. And holding it all together is the incredible talent of guitarist Mike Boyd and Keyboardist Loren Kranz (the Barbarossa Brothers). Stage Manager and "Santa" Chris Good and Emcee Extraordinaire Shelly Smith keep the show rolling--no simple feat, especially when trying to wrangle 20+ performers on the Ark stage (which is crowded with a 5-piece band during ordinary shows!). From country to rap, folk to rock, and jazz to 18th Century Holiday music, the EBird House band rises to the challenge, and crushes it every time! Everything a String Section Should Be! This year's show opened with a complex and nuanced arrangement of "O Come All Ye Faithful" which showcased the string section in it's somewhat traditional opening, and then somehow transmogrified into the "infectious global groove" the Ragbirds have made famous. All of the performers joined Erin on stage to sing an African harmony-heavy accompaniment (Ala Paul Simon's Graceland) and gospel counterpoint to give a nod of respect to the religious background of the holiday while simultaneously giving the song a contemporary update and high energy conclusion. As the last glorious note boomed and echoed through the hall, a brief moment of stunned silence fell over the crowd before they erupted into thunderous applause. This was followed by the House Band and their unique arrangement of "Carol of the Bells" that played the almost childlike simplicity of the xylophone melody against Ross Huff's complex jazz-tinged horn arrangement. All-in-all it was a great way for the house band to showcaase their musical chops and set the tone for the rest of the evening. Next up was Ann Arbor area singer/songwriter Chris Dupont. It is easy to find yourself transfixed by his ethereal and soulful vocals, but to do so would be to miss his remarkable finger-style guitar work. Able to mix traditional folk-based sounds with subtle blues-influenced licks, his playing is incredibly rich and textured and truly adds to his sound. 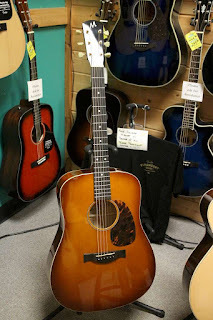 For the show, Dupont chose to update the Jackson Browne classic Rebel Jesus with a heartfelt, almost James Taylor vulnerability in his singing. He followed this up with a Renaissance era ballad, Brightest and Best of the Sons of Morning; a song he updated and "punked up a little" with the use of a loop pedal rhythm and a remarkably powerful accompaniment by Jessica McComons of The Understory and the irascible Jen Sygit. Chris has the sort of pure voice that melds effortlessly into others, so it was no surprise that he was onstage multiple times during the show lending his voice to the chorus. Up next were SeMiBluegrass Thrashgrass favorites, Alex Holycross and Jake Sawicki of the Native Howl. 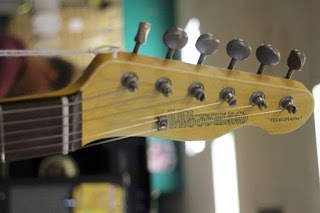 Readers of this blog will remember that the Native Howl and the Ragbirds first met this summer in a "Ridiculously Cool Concert Event" at CAD Studios. Impressed by their energy and professionalism, Erin invited Alex and Jake to bring their blend of bluegrass and thrash metal to the holiday show, and they did not disappoint. Their country/bluegrass cover of Blue Christmas featured the Lindsay Lou of Lindsay Lou and the Flatbellys, whose powerful and husky voice played well with the metal-tinged growl of Holycross' voice and Sawicki's bluesy harmonica. However, it was their thrashmetal rendition of God Rest Ye Merry Gentlemen that set the crowd on their ear and elicited joyous cheers from the audience. After an A Capella opening, a "Two-Three-Four" growl unleashed a frenetic, hair-flinging, head-bobbing assault on this yule-time classic, culminating in Holycross trading blistering call-and-response bouzouki licks with Erin's fiddle. This was definitely a high-energy point of the show and had the crowd on their feet cheering. The Soulful Jen Sygit Letting It Rip! A fixture at these shows is always Earthworks Music Collective artist Jen Sygit on backing vocals. Professional as they come, her powerful voice serves as a massive foundation to build harmonies on. However, she is so much more than a background singer. 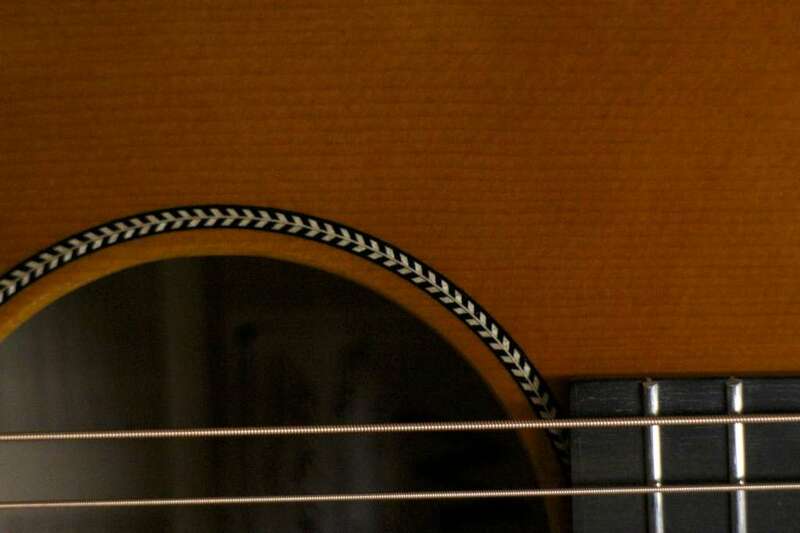 As a member of penultimately SeMiBluegrass groups Lincoln County Process and the all-female folk/roots band Stella, many readers of this blog are undoubtedly familiar with Sygit's powerful singing and rock-solid guitar work. She also hosts a rare roots music radio show, Eclecticana, in the Lansing area and is tremendous solo performer as well. Hard to categorize, her music at the holiday shows usually has a somewhat classic country vibe with driving guitar, poignant lyrics and killer harmonies. Her selection this year, Home for Christmas, was no exception and was one of my favorite songs of the evening. During my college years in the mid-to late-80s, I fondly remember the music of Frank Allison and his band the Odd Socks. No longer a bar-closing rocker, Allison has overcome the steady progress of time, and a severe vocal condition to bring his unique brand of holiday cheer to the Holiday show. With an impish glint in his eye, and special "elf" glasses and hat, he presented two remarkable, original pieces of Christmas music to the crowd. Santa's Myth coupled Frank's gravely, yet remarkably warm vocals with a reggae-infused ukulele groove and some rubber-kneed dance moves that had the crowd "ho-ho-ho-ing" along as he sang. With costume change ("Shh! Don't tell Santa. 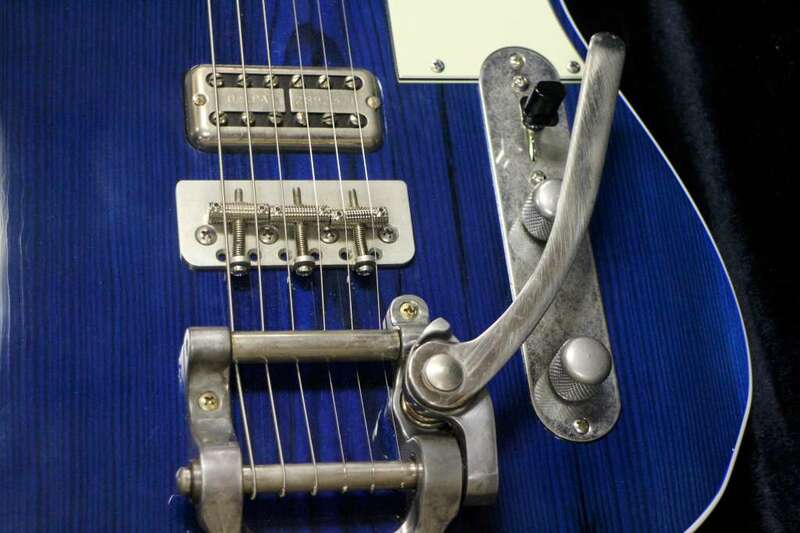 This is a felony at the North Pole") and switching to slide guitar played dobro-style with Lowell George inspired Craftsman 5/16" socket for a slide, Allison told a somewhat melancholy tale of Santa with Ho Ho Ho and Here We Go. Allison's performance this year somehow epitomized the joy and togetherness that Christmas means to so many. Jess McComons Preaching "Love is Everything". Closing out the first set was Jessican McComons, who somehow managed to transform Ariana Grande's pop hit Love is Everything into an instant Holiday Classic. Aided in no small part by McComons' unbelievably powerful vocals, the cast of the show joined her on stage and took the crowd to church with a gospel-inspired background vocal. Building on the pop-music vibe, Grand Rapids rapper Rick Chyme jumped on stage and, unbelievably, brought even more energy to the performance. Later in the 2nd set, Chyme--fronting a funk-based rap groove featuring TJ Zindle's Wah-Pedal infused guitar work--brought the crowd to their feet answering his "Share That!" with "LOVE!". Truly an inspirational performance, and a perfect message for this year's show. A brief intermission followed the first set with an opportunity to meet many of the performers and visit the merchandise table. As always, I find the perfect gift for the hard-to-shop for person on your list is the gift of local music. After kicking off the second set with an inspiring medley of Christmas instrumentals by the strings and percussion, Emilee Petersmark and Kate Pillsbury of The Crane Wives took the stage and showcased their unique and memorable approach to harmony singing. 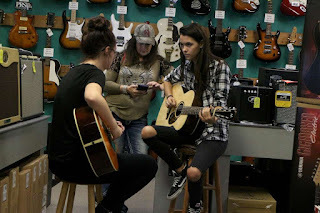 I know that the Crane Wives usually perform as an electric-guitar driven rock band, but after hearing them at the Holiday Show I was blown away by their acoustic sounds and hope they find a way to incorporate that into what they do--it is fantastic! In a stroke of genius, Erin suggested that Emilee and Kate cover Mr. Little Jeans' Dear Santa and their almost 50s Do-Whop guitar and swirling, dissonant and layered harmonies took a sweet holiday song and transformed it into a hard-edged, rock-n-roll classic. Most importantly, it is obvious to the observer that these two love singing and making music together, and--like all great artists--that joy and respect for each other shows in their performance. Lindsay Lou and the Horn Section--"Frosty"
Lindsay Lou kicked off her contribution to the show with a soulful version of Frosty the Snowman. Behind her uniquely bluegrassy, thumb and finger pick guitar work, Lindsay's smoky, sultry vocals set the stage for some incredible jazz improvisation by the horn section. However, it was her cover of Ella Fitzgerald's What Are You doing New Year's Eve that proved to be the most memorable. Channeling her inner torch-song diva, Lindsay showcased both her incredible vocal range, and her complete command of dynamics and tone in her singing--starting softly and sweetly and slowly, agonizingly, building to a powerful and emotional climax. It is easy to close you eyes and image you are listening to a wizened and seasoned vocal veteran, and not a young, self-taught bluegrass singer. Lindsay is simply a gifted vocalist and I can't wait to see where here musical adventures take her. As is traditional every year, there are several ensemble numbers featuring the house band and The Ragbirds that round out the show. This year, solo performances by Erin and T.J. Zindle served as perfect bookends and counterpoints to the show. T.J.'s original song Christmas in the Music Shop combined humorous storytelling with punk-rock guitar licks to celebrate the joy and happiness of the season, while Erin's touching and poignant nod to the pain of holidays without loved ones, Christmas In a Box, called on us to cherish those around us and reach out to those who are hurting. Stage Manger Chris Good (as Santa) led the most SeMiBluegrass number of the evening with an almost pure bluegrass arrangement of Jack White's Christmas Time Will Soon Be Over, that allowed most of the guys to show off their instrumental chops on a song that would be right at home at any bluegrass festival campground jam. It was the final three songs of the evening that most profoundly impacted me--each for a different reason. The first was The Ragbirds cover of a traditional Christmas Hymn Rise Up Shepherd and Follow, featuring the entire cast on stage singing background. Following Erin's lead the song continued to grow and swell until the vocals drown out the band, filling the room with joyous harmonies that made the hair on my arms stand on end. The power and emotion of the singing could fill the grand cathedrals of Europe. In these small, intimate venues it washed over the crowd like a tidal wave, cleansing the soul and rejuvenating the spirit of all in attendance. Arriving way too soon, the last song of the evening was Mary had a Baby, an ensemble piece that both lets the global groove of the band and ensemble singing of the cast shine. Members of the audience, new and old alike join in and sing along during the chorus. It is the perfect, celebratory song to end the show. We all know that 2016 has been a brutal year for musicians. We have lost so many of our musical icons. It was therefore somehow perfectly fitting that the musicians chose Leonard Cohen's Hallelujah as their encore. With the whole cast on stage, Frank Allison kicked off the song with his whispy and melancholy voice. Chris Dupont took the next verse and added his pure, clean vocals. 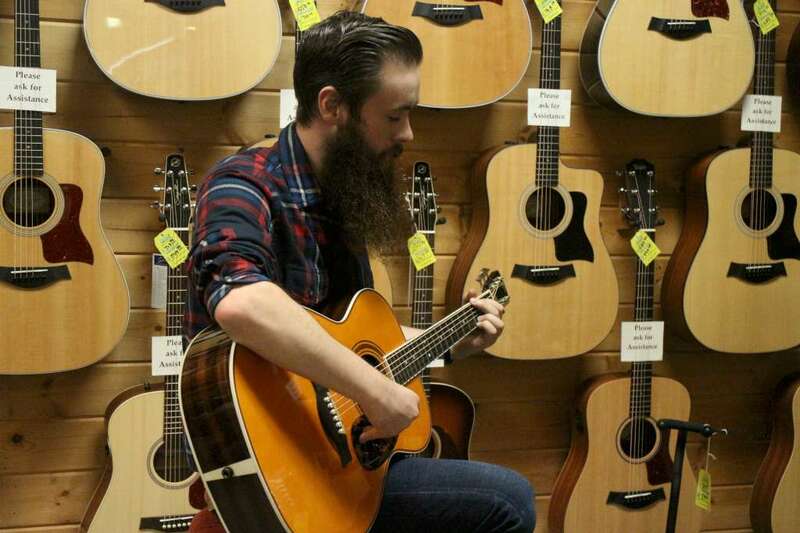 Jake Sawicki added a little bluesy soul leading to Alex Holycross' metal-tinged outburst. As the band continued to build the energy, Emilee and Kate of the Crane Wives contributed a powerful and moving duet during their verse. Linsay Lou reached deep and took the audience from soft and sultry to proud and powerful leading into the whole cast singing the chorus with all their heart and soul. With tears streaming down my cheeks and a sob in my throat, I did not want the song to end. But when it did, I found myself transformed. Somehow, in these difficult and chaotic times, this performance reminded me of all the good in the world; that when all else fails, we have each other; and that music--especially live, local music--gives us hope. Next year will be the 10th annual show. Put it on your calendar and make it a point to go. It will profoundly impact you. I promise. Want more articles and reviews like this? Consider subscribing to the blog. Or, follow SeMiBluegrass on Facebook. Sometimes the greatest thing in life are right there, under you nose, hiding in plain sight. Nowhere is that more true that right her in Southeast Michigan. Last Saturday, almost within walking distance of my house, three truly unique entities came together to create something magical. 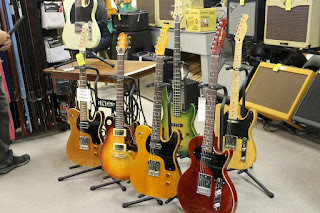 At first glance, you might be tempted to think that this "Demo Day" was just a cliche' weekend sales gimmick from another, unassuming strip mall music shop, and you couldn't be further from the truth. 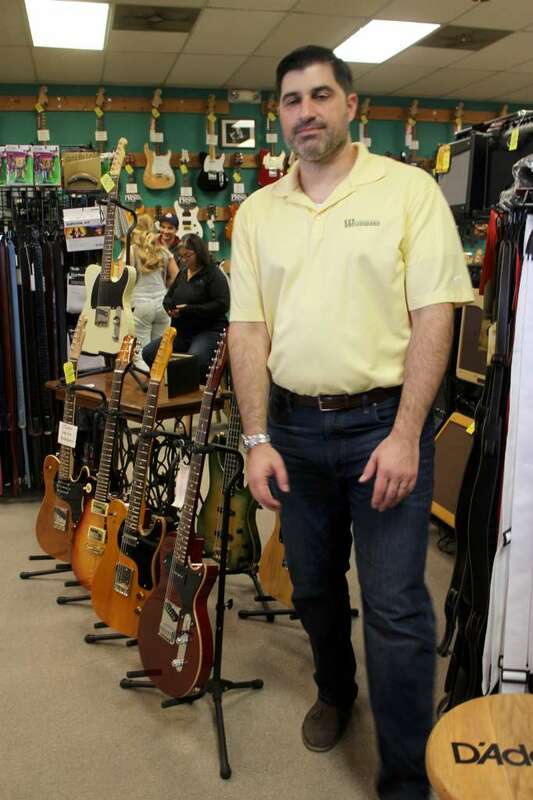 For starters, The Music Man in Brighton is far from another cookie-cutter guitar store--offering a great selection of high-quality guitars from all the best manufacturers (Fender, Martin, Taylor, Gibson and the list goes on) as well as exceptional customer service, knowledgable sales staff and talented instructors for persons--young and old--wanting to learn to play nearly any instrument. There is something for everyone at "The Man". 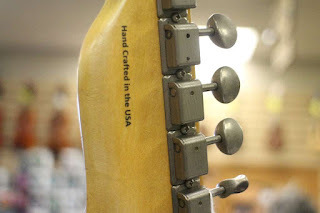 Secondly, the two guitar makers showcasing their wares (Woodward Guitar Co. and MacMillan Guitars) produce not only superb, high-end guitars, but heirloom quality instruments with a story worth telling--and both makers have a strong connections to SouthEast Michigan to boot! 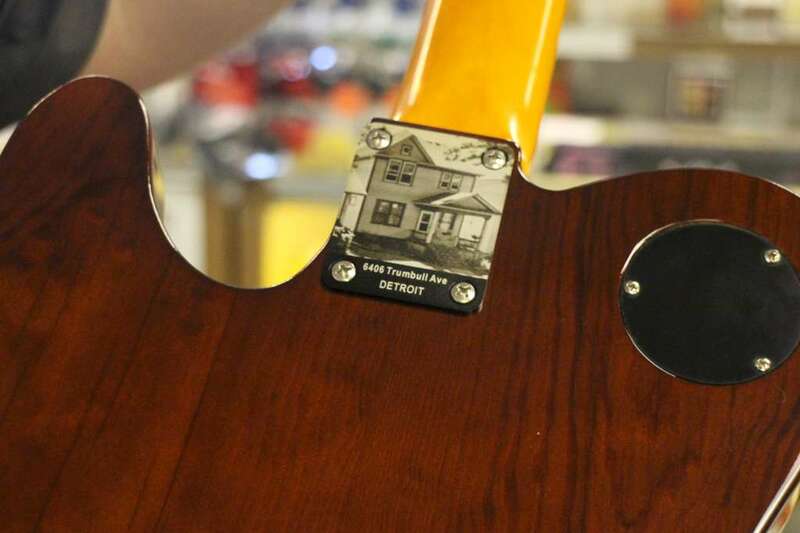 This Home Became a New Guitar--Cool, Right? The Woodward Guitar company owes it's start to detective and amateur woodworker Curt Novara making a trip to Reclaim Detroit in search of some wood to make furniture for his house. For those not familiar, Reclaim Detroit specializes in salvaging building materials from blighted homes in Detroit that would otherwise be sent to the landfill. As an amateur musician, Novara stumbled on a nice piece of old-growth Douglas Fir and realized that he could turn this piece of reclaimed timber into a great sounding electric guitar. From those humble beginnings grew the Woodward Guitar Company offering a Les Paul inspired semi-hollowbodied "Standard" model and the Telecaster-inspired solidbody "Telegraph" model. 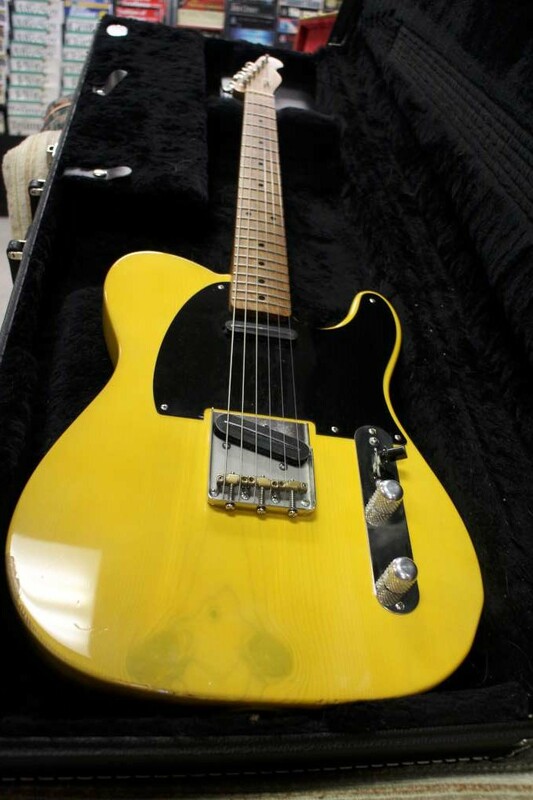 An electric bass has recently joined the lineup as well. The real standouts are the Telegraph models that feature reclaimed wood throughout, high-quality components and locally wound, custom pickups. Traditional construction and classic nitrocellulose finishes give these guitars oodles of character, and Novara will work with the buyer to customize the builds to suit their playing style (just browse the website to see the depth and breadth of configurations he's already built!). The coolest thing of all however--and what really gives these guitars personality and soul--is the Certificate of Authenticity that accompanies each guitar. Along with a photo, you get the address and the story of the home the timber came from and how it was "reborn" in to the guitar. 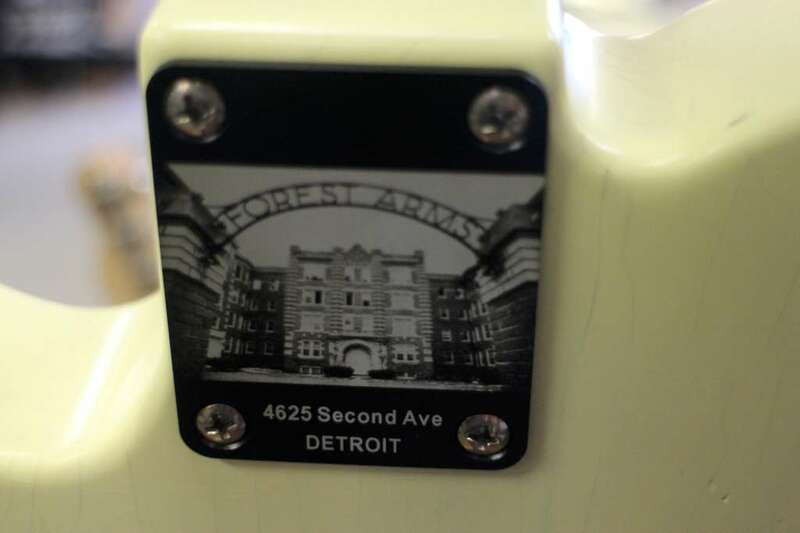 Custom engraved heel-plates also feature a picture of the home on each guitar. 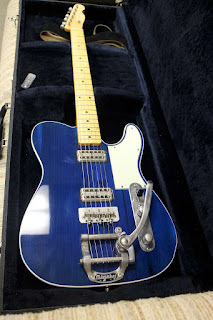 From twangy county-style chicken pickin', tone-dripping blues solos and even some Detroit-style funky rock-n-roll guitar riffs, these guitars sound GREAT. 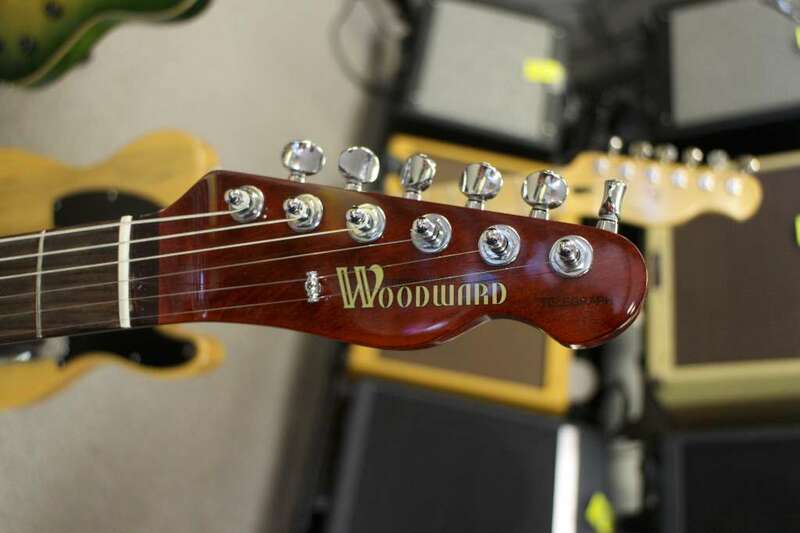 If you're in the market for a one-of-a-kind guitar at a remarkably reasonable price, look to the Woodward Guitar company. You won't be sorry. A selection of Woodward Guitars are on display at the Music Man, as well as Motor City Guitars in Waterford and Detroit Guitars in Birmingham. Or check out their website. Sound Even Better Than They Look! 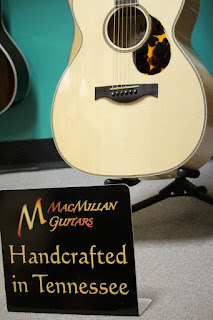 Also on display were the finely hand-crafted guitars of Nashville luthier Marty MacMillan. A Brighton area native, MacMillan made a name for himself building spectacular custom guitars, and has moved his operation to Mount Juliet Tennessee. Returning to his roots, he brought five great guitars with him to show off. 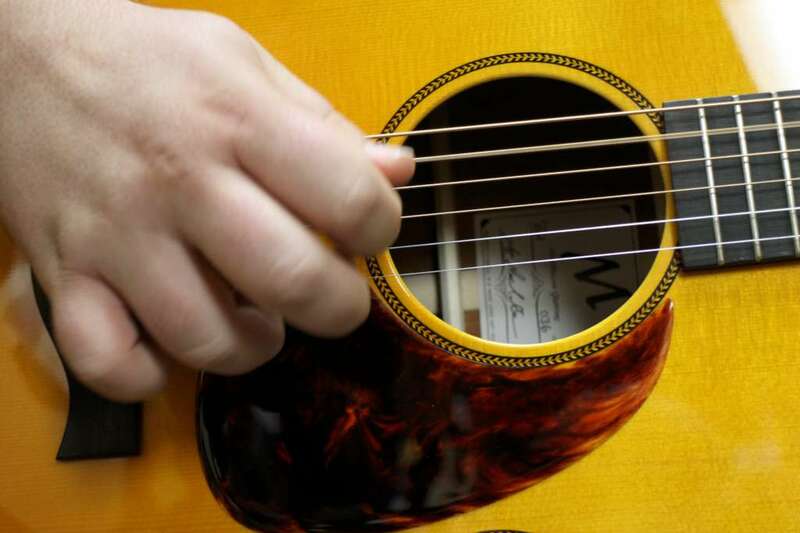 These are beautiful instruments with woods picked not only for tonal quality, but for beauty and character. Like his binding, inlays and finishing, MacMillan eschews super-exotic woods and treatments, instead choosing simple elegance, immaculate construction and classic styling to set his guitars apart. 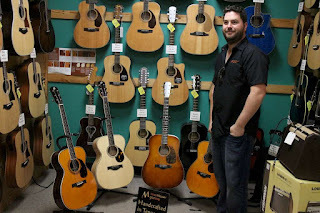 Most of the guitars he brought were "Orchestral" (OM) models (some with deeper, "dreadnought" depth) and, in the hands of some remarkably talented customers, sounded amazing. 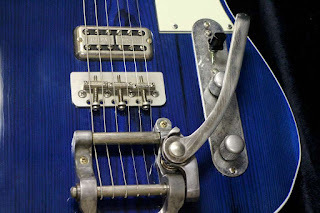 These are sweet guitars producing the type of layered and complex tone you'd expect from guitars costing ten times more. 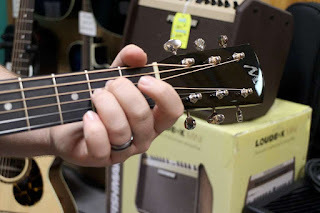 I got a chance to play the Maple dreadnought Marty brought with him. 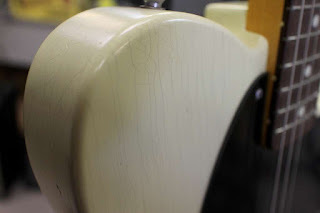 The warm burst coloring on top and sides was exquisite, as was the classically understated herringbone binding. This guitar would be right at home at any bluegrass jam. As expected from a maple-bodied guitar, the tone was bright and clear, with subtly nuanced harmonics and crystal clear note separation. 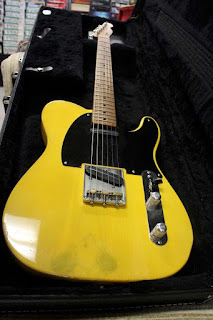 I didn't expect the powerful bass tones this guitar produced--capable of standing up to any banjo player you know! I have to admit, I loved this guitar. Check out Marty's website for information on how to order yours today. I've included some photos below. Please feel free to check them out (or look for the whole gallery on the SeMiBluegrass Facebook page. Tired of the watered down, hooky, pop-driven drivel that passes for country music on the radio today? Hankering for some real, old-school country music sung with passion and flair? Want songs about love, life and loss instead of beer, barbies and badboys? Well then, have I got an album for you! 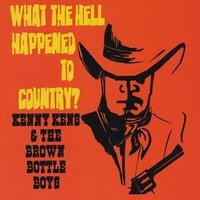 Kenny Kens and his stellar band, the Brown Bottle Boys, just dropped What the Hell Happened to Country? and it's set to blow your mind! Raised on Ernest Tubb, Carl Smith and Hank Williams (with a little Lefty Frizzell and Johnny Cash thrown in for seasoning) Kenny Kens grew up listening to and playing traditional country music. Frustrated by the so-called "Pop-Country" and "Bro-Country" dominating the airways, he set out to record an album showcasing what country music is supposed to be. Surrounded by an all-star cast of musicians including southeast Michigan Legend Mitch Manns, he and his Brown Bottle Boys mash the throttle to the floor and trade guitar and pedal steel licks behind poignant and clever lyrics to deliver an eleven song masterpiece of Classic Country. Kenny Kens and PBR. Perfection. I have to admit, it took an enormous pair to kick off an album with this title, with a hard-driving, banjo-fueled bluegrass barn-burner (featuring Mann's distinctive Scruggs-style banjo pickin'). Ain't Coming Back is as high energy and catchy as they come and, while distinctly different from the other tracks, serves as the perfect appetizer to the ten course dinner to follow. With so much attention paid to staying true to the fathers of country music, it was somehow appropriate to also acknowledge the role bluegrass played as grandfather to those greats. 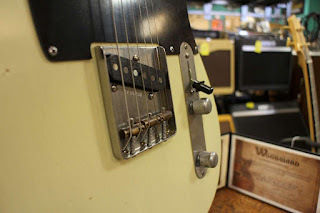 Kudo's to guitarist Brian Coogan who tears off a killer acoustic guitar lick in this song, that starts out sounding like a mandolin, works it's way through some telecaster licks and resolves into some string-bending blues. The Brown Bottle Boys Gettin' It Done! The remainder of the album is pure, classic country featuring Ken's smooth, soulful lyrics--dirty and grit-filled on some songs, plaintive and wailing on others. 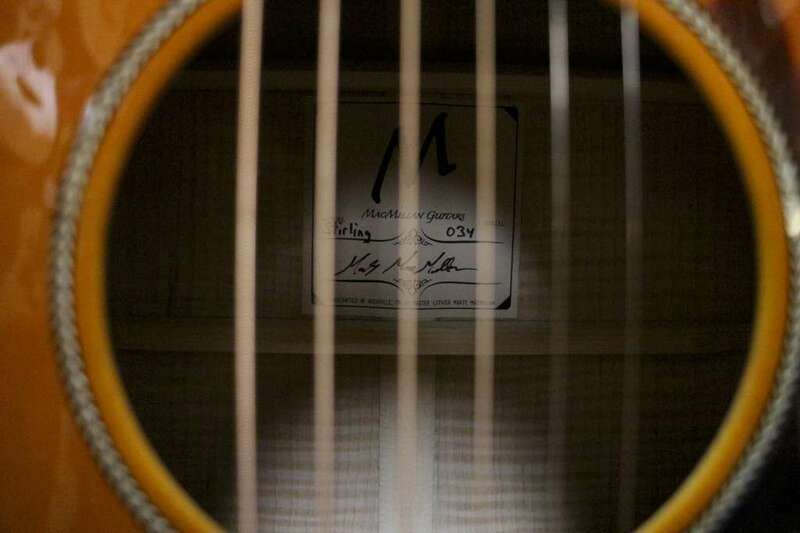 Kenny can sound like Hank, or Merle or Travis--while somehow always sounding like himself. He also stays pretty true to the classic country sound both in is vocals, and in his songwriting. While Chris Stapleton and Sturgill Simpson are making names by themselves by taking classic country and stretching it into new horizons, Kens has chosen to explore the tradition, coloring and nuancing his tone to fit the lyrics. Backed by a stripped down drum-kit courtesy of Brian Ferriby and some simple, yet elegant bass lines from Steve Wyse (a larger than life character both musically and in person), the rhythm section supports the lyrics with a driving groove. Solo instrumental work on the album is specacular with guitar work from Coogan, Manns and Dave Beddington. 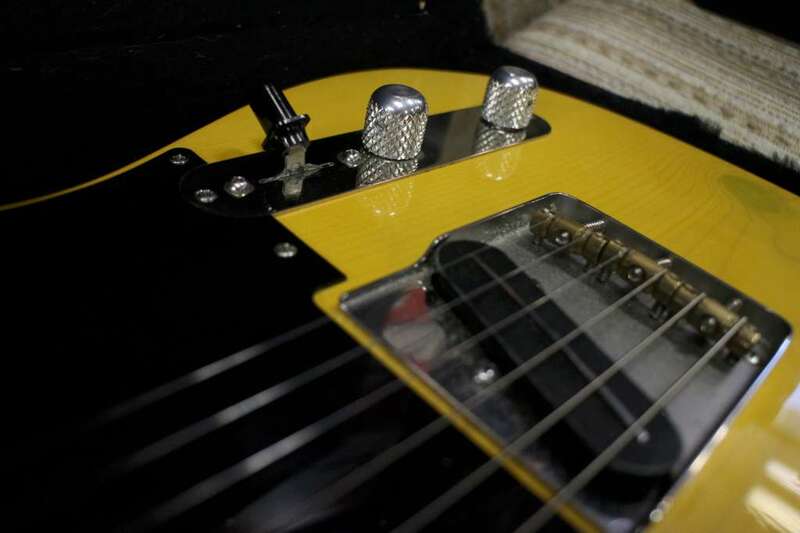 Want to hear what country guitar should sound like? Just listen to any of the songs on this album. And wait! There's more! What country album doesn't have some killer pedal-steel guitar work? 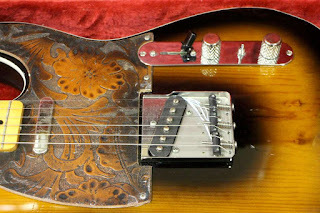 Billy Cole's slide work on this project definitely helps define that old-school country sound. Kenny wrote most of the songs on the album, and they're all keepers, combining great storytelling, with classic country hooks and some clever surprises. The lyrics are raw and from the heart--and sung with absolute abandon. She Might Outlive Me (a traditional country shuffle written by Kenny's Uncle Ronnie Murray) sounds like it should be coming out a 1940s living room radio on a Friday night. What the Hell Happened to Country? is a straightforward ode to oldschool and takes some good-natured jabs at the radio country-pop stars of today. The guitar line in I'll Have a Drink Then I'll Cry is worth the price of the entire album, and the texas-swing pedal steel has that slightly Hawaiian sound of the early days of country music. The eminently danceable Learning How to Forget should be mandatory listening for every country drummer and bass player out there. Very sparse but still keeps thing moving along at a brisk pace. Somehow, I can hear Patsy Cline singing Kiss Me Before You Tell Me Goodbye. 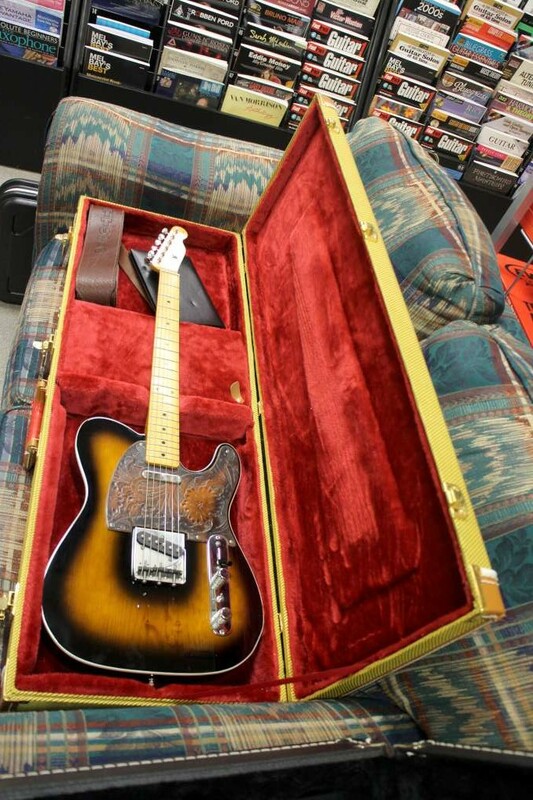 The good-time blues number I'll Get Along Without You Just Fine will have you tapping your toes and shouting "Amen! Brother"...a true anthem to guys done wrong by the women in their lives. Kens can also get down and lonesome, as evidenced on the unrequited love ballad I Just Need to be Loved by You. There's a little Dwight Yoakam in the swingy honky-tonk party-ballad Steppin' Out--and it's as good-time a song as you'll find. My favorite is probably Brown Bottle Flu, an ode to those days we realize that we don't bounce back from those late night parties like we did in our 20s. The Johnny Paycheck number Pardon Me I've Got Someone to Kill is an earwig of the worst kind...the hook will get in your brain and have you humming along all day. Just a quick review that hardly does justice to this incredible album. I'm sure this is destined to spend some serious time in my car's CD players. Get yourself a copy (or digital download) from CDBaby.com (worth it just for the shipping notification). Or better yet...go see the band play, shake a howdy afterwards and thank them for bringing back country music (and buy a copy direct from them). The capstone event to my summer of music festivals was, as always, the Marquette Area Blues Fest. Held every Labor Day weekend for the past thirteen years at the aptly named Ellwood Mattson Lower Harbor Park, this event brings together the very best local, regional and national blues acts on a magnificent stage in one of the most beautiful and scenic settings imaginable. It will be nearly impossible to top the talent on display this year. The tone was set during the FREE Friday night show featuring the classic blues stylings of Tre & the Blue Knights (wsg Lady Kat), and culminating with the the guitar-gymnastics of JW Jones and "Laura On The Bass" Greenberg--on display for a raucous, yet well-behaved crowd of blues fans, locals and college students alike. JW made the excellent point that free shows like this go a LONG way to helping promote blues and roots music to a younger crowd. It was certainly a success in Marquette. Victor Wainwright--"The Piana From Savannah"
Saturday featured completely different, yet amazingly entertaining acts that played well off each other and kept the fun, and the energy building all night. Reverend Robert brought Mississippi style blues and slide guitar to open the day under bluebird skies and mild, 70 degree temperatures. The largest band of the weekend, hailing from the smallest town in Michigan (Alpha), Sons of Legends gave the crowd a full set of hard-rocking, roots blues--and kept the party going all day long, hanging out with the crowd, passing out "Legendary" tee shirts (thanks guys!) and generally having a good time. Next was South East Michigan's own Chris Canas Band, who surprised the crowd with one of the most intersting, high-energy and unexpected sets of the weekend. More on them below. The night concluded with two Memphis bands who brought Beale Street to the shores of Lake Superior. The Ghosttown Blues Band (due in no part to the frenetic encouragement of "hype man" Suavo) set the crown up with their Alman Brothers inspired jamming and some unbelievable cigar-box guitar word from lead man Matt Isbel. Closing out the night was the boogie-woogie piano of 2016 B.B. King Entertainer of the Year (and Band of the Year) Victor Wainwright & the Wild Roots who picked up where Ghosttown left off and then nocked them down. The evening culminated in a dual-band jam session that pushed the crowd to the very edge (and the festival to the edge of a noise ordinance violation--none was given, but it would have been totally worth it!). 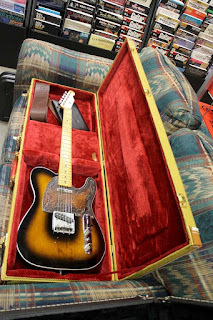 Sunday featured more of the same, starting with solo acoustic blues artist Brian Keith Wallen and his "cupboard door/mixing bowl stompbox" (you have to hear it to believe it). Long time Marquette favorites the Flat Broke Blues Band celebrated fifteen years of playing together with a driving set of new and old material. West Michigan's Hank Mowery & the Hawktones brought not only his solid harmonica licks and smooth, soul singing to the stage, but surprised the crowd with the addition of Kate Moss on guitar. 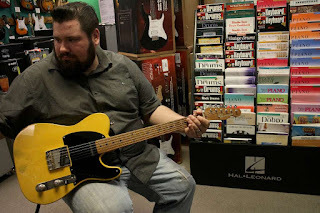 As an unexpected bonus, south east Michigan's own expatriated Marquette native, George Friend (of Laura Rain & the Caesars) got up on stage and flat out KILLED a couple of tunes on a telecaster. Hank later hosted the after party jam and brought some ridiculously cool combinations of these acts to the stage (including a funky Motown-inspired number by Ms. Rain herself!). The Kinsey Report kept the energy high with soulful blues, witty stage banter and even channeled the late Bob Marley for some reggae tunes (or "island blues" as I like to call it). The Samantha Fish Band closed out the festival giving the crowd everything they asked for (including a "War Pigs" finale). This was truly a weekend of exceptional acts. However, since this is a "southeast Michigan" music blog, I'm going to pick the set from the Chris Canas Band as my "standout performance" of the weekend (OK...I'm definitely biased here). From the moment the band rolled through the artist entrance backstage you could tell they were here to entertain. Disregarding the festival's legendary (epic?) green room, the members of the band arrived early, took in the opening acts, talked to the other bands and started working the crowd. Professional to a tee, they showed up in stage clothes, shook every hand and answered every question people asked them. Any festival promoter thinking of booking this band should know that this might be the very best decision they make. Besides their exceptional talent, the band has amazing stage presence, contagious likeabilty and complete professionalism. A rare combination now days. Lots and lots of pictures from the festival below. Please feel free to use, share, tag with credit to SeMiBluegrass.com. Like us on facebook or subscribe to the blog for more great music and events like this.